CUSTOMER SATISFACTION: All components of the PowerUp Propulsion System are thoroughly tested prior to shipping. In the event you encounter any problems or concerns with your propulsion system, please report them to PowerUp Kayaking as soon as possible. We are committed to assisting you with any difficulties encountered with your purchased system, including any issues you might encounter with its installation. We accept no responsibility for problems related to abnormal abuse, misuse or unauthorized modifications. While all sales are final, we are dedicated to ensuring your satisfaction with your purchase. PAYMENTS: You agree to pay for all products you purchase online, and grant PowerUp Kayaking permission to charge your payment method for any products purchased and for any additional amounts (including any shipping, taxes and late fees, as applicable) that may be accrued by, or in connection with your order. You are responsible for the timely payment of all fees and for providing PowerUp Kayaking with a valid payment method for payment of all fees. SHIPPING AND TAXES: Your total price will include the price of the product plus any applicable shipping and sales tax; shipping fees and sales tax are based on the ship-to address and the sales tax rate in effect at the time you order the product. We currently asses tax only on orders shipped to North Carolina addresses. DAMAGED GOODS: We thoroughly inspect all items prior to shipment. We suggest you also thoroughly inspect the items before accepting delivery. If damage is apparent, contact PowerUp Kayaking as soon as possible. Do not discard the box or any packaging materials. 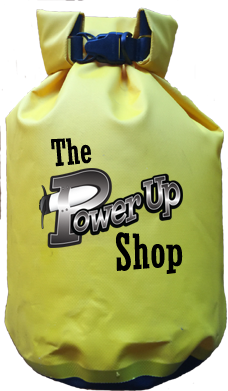 It’s the purchaser’s responsibility to assist PowerUp Kayaking in the filing of damage claims, and to provide evidence, including photographs, of the damaged packaging and product. BACKORDERS: If a product is out-of-stock, we will notify you via email immediately, and provide you with information on when the order can be filled. SAFE USE: With purchase, customers acknowledge they have reviewed all information related to the safe use and handling of the PowerUp Propulsion System, and have read and understand the “Safe-Use Guidelines” for this system. SERVICE: In the event service is required for any of the system components, please contact PowerUp Kayaking prior to shipping, to obtain detailed instructions. Shipping for repair or replacement of components is prepaid by the customer.